Spacious, Bright cabin with two bedrooms. One queen and one double bed that you have to walk through one bedroom to get to the other bedroom. 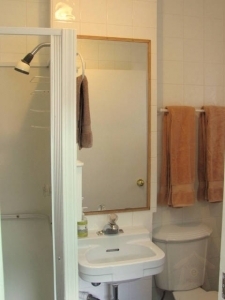 The bathroom does not adjoin the bedrooms. 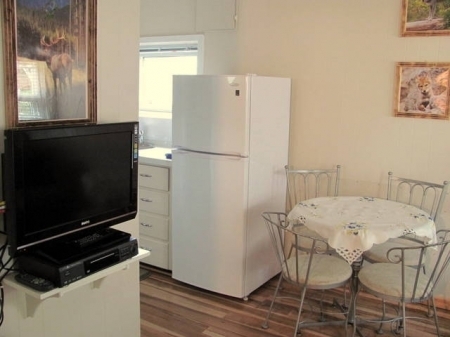 Also with a living area and Microwave Kitchenette. Located within the heart of Banff, these cozy cabins are a peaceful refuge surrounded in panoramic beauty. Grab your morning latte from Starbuck's or brew your own in your cabin and head up Tunnel Mountain, a 20 minute hike out your back door, to catch the breathtaking views and sunrise. Then head out for a game of golf on one of Alberta's finest golf courses, all within easy commuting distance, or saunter downtown to find the trendiest shops and more. All this makes for a fabulous vacation destination resort. Welcome to Banff Beaver Cabins, a "Class B Alberta Heritage Site" and one of the earlier set of tourist cabins built in Banff. 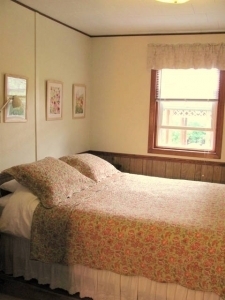 Our cabins consist of five fully furnished, cozy one bedroom and two bedrooms vacation rental cabins, all with full bathrooms, kitchenette and some with living rooms, situated in downtown Banff, one block away from Banff's main street. Living and dining areas are comfortably furnished. 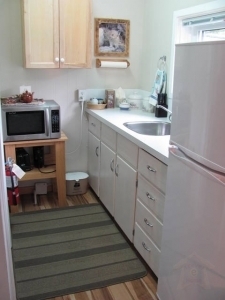 The kitchens are well equipped, with all the amenities of vacation home.